Hey, are you feeling overrun by the toys? Do you fear having to get up in the middle of the night because you know you’ll trip over something? Legos, I’m looking at you. Do you just wish there were fewer toys? I’m tired of the same scene repeating itself in every room of my house. I’m tired of the toy takeover. No more wishing! I’m taking my house back! I will walk the hallways without fear! Do you want to take your house back too? Today, I’ve got 6 steps for you that will get the toys under control. You’ll need some storage containers and some trash bags. Hefty Ultra Strong Kitchen Trash Bags were a huge help with this project. 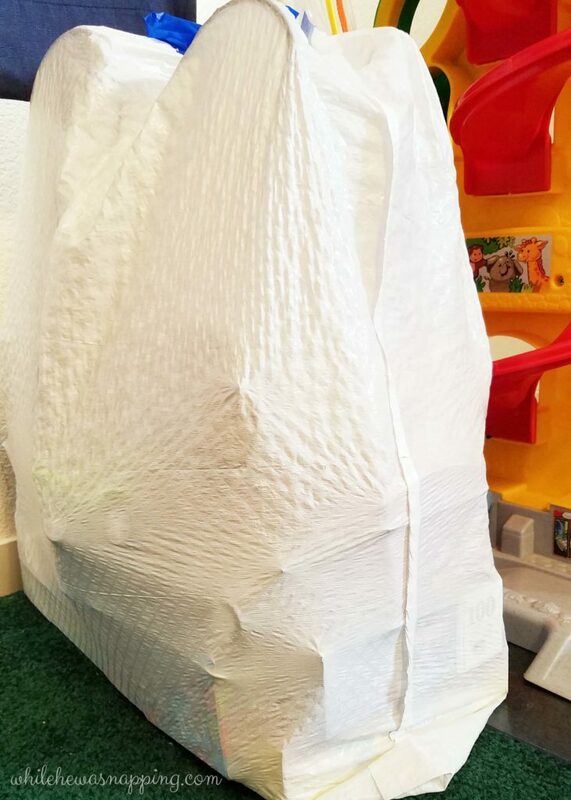 The Ultra Strong bags have active tear resistant technology and were super strong even when I put heavy toys or toys with sharp pieces of corners in them. The break resistant drawstrings made the bags easy to tie up and to transport around my house, out to my car and into the donation center. Definitely a plus, since I was doing all the heavy lifting and hauling myself. John Cena has teamed up with Hefty and I sure could’ve used a set of muscles like those to haul my bags around during this project. We are now using the bags in our trash cans and I love the Arm & Hammer patented odor neutralizer that keeps the stink down – no one likes a stinky house! My only complaint is that they aren’t quite long enough for my kitchen trash can, but they are perfect in my bathrooms and my office. 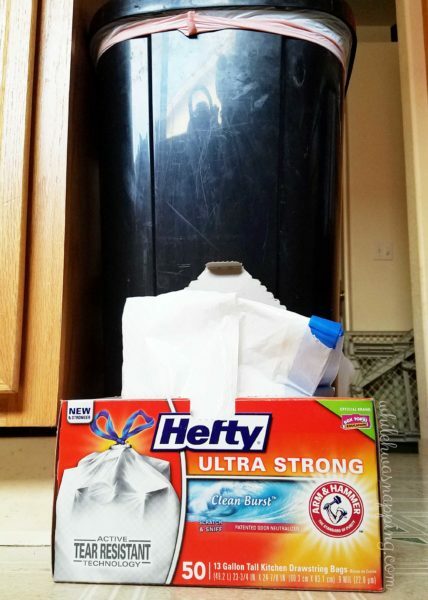 The Hefty Ultra Strong Kitchen Trash Bags are Hefty’s best bag ever, at a new low price. Can’t beat that! 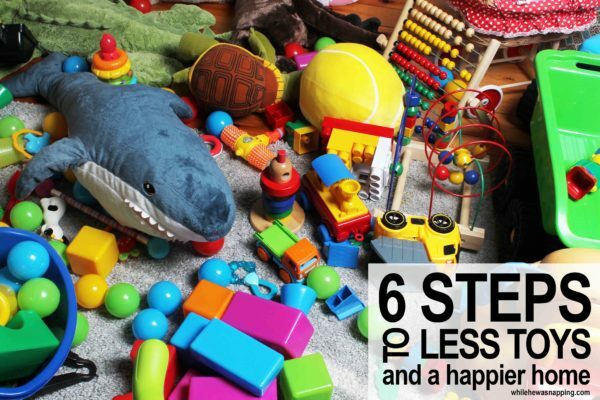 Follow these 5 steps and you’ll find fewer toys littering your floors. You can try to do it with the kids, but I always find it much easier to get rid of toys without the “help” of my kids. Toys they haven’t played with in months are suddenly their favorite toys ever and their little inner demons are out for vengeance. It’s also faster for me to just do it.. I don’t feel the need to stop and play with every. single. toy. Just the really good ones. Kidding. Mostly. Let’s get started, shall we? 1. Designate ONE place in your house for your toys. My boys had toys in four different rooms in our house. Of course there were toys out all over the place! They’d play with something in one room, get tired of that and move to another room. I’d run around all day, tyring to get them to clean up a mess that they didn’t care about. Putting all the toys in one place will make it more necessary to clean up what is out now before something else gets pulled out. 2. 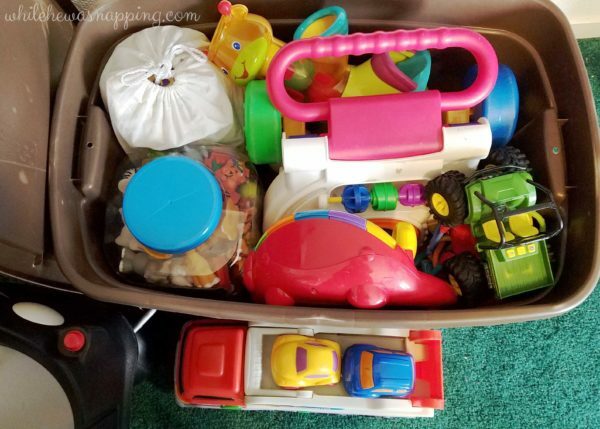 Find a container for each kind of toy. Imagine if you were putting your jewelry away and all you did was to drop everything in a box or bag. I don’t know about you, but I would dread trying to find a pair of matching earrings in my collection. What a mess. Put all the Lego bricks in one container, all the cars in another container, and all the animals in yet another container. You see where this is going. When the kids go to pull out the toys, they pick ONE container. Everything is there and the rest of the toys stay put away. There’s fewer toys out and less toy mess. I used several empty animal cracker containers and a few small toy chests and things we already had. Begin by gathering all the toys to one room. Yes, all of them. And, preferably the room where you will be keeping all the toys. It’ll just be easier. Check everywhere for pieces and parts. If you have all the toys, the next few steps will be easier and go much quicker. Sort the toys into types. This will help you see where you can get rid of some toys and if you have any overlap. We sorted ours into building toys, cars, baby toys, dress up, and everything else. We had several different kinds of blocks and it was easier to part with a couple sets when it was clear to see we weren’t losing all the blocks. Same thing with the cars. It was a lot easier to convince my kids (and myself) that we didn’t need a 25 gallon tote of cars. Seriously. Put the toys away into the space you designated in step #1. Give everything a place. If there’s no space, find one or get rid of the toy. We have a hutch we picked up off of Craigslist about 5 years ago that is now used to store our toys and games. Our general rule is that if it doesn’t fit in the hutch, it doesn’t stay. We do have some exceptions – the dress up bin that gets stored in the top of one of the closets, for example – that are granted a pass. I also allowed each boy to keep 3 toys in his bedroom. We’re talking self-contained toys here, not something with 3,000 pieces. I may allow them to rotate out which toys are in their room every so often. I haven’t decided on that yet though. This may be the most important step. DO NOT SKIP THIS. All your hard work will be for nothing if you don’t get those banished toys out of your possession. Not just out of the house. Give them away. Donate them. Sell them. Recycle or put them in the trash. The secret to less toy mess is… are you ready for this… to own fewer toys! They will always find a way back if you don’t get them out of your possession. The sooner, the better. You can do this! I put our “Donate Toys” into Hefty Ultra Strong Kitchen Trash Bags, tied them up so my kids couldn’t get anything out before they made it to the donation center and loaded those bags into my car so we could drop them off the next time we were out. Mr Napping was out of town and I sure could’ve used a big strong muscly man (like John Cena) to carry those out for me… but, no pain, no gain. Right? How can this possibly get better than less toy mess? If you use Hefty Ultra Strong Kitchen Trash Bags to gather your toys in for donation, right now, you can save $1.00! Hey, a dollar is a dollar. Now you can splurge on that candy bar you’re eyeing at the check out stand. 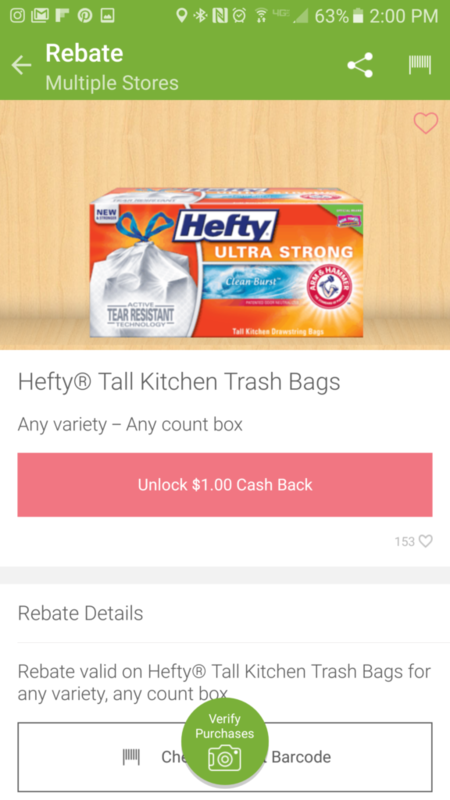 Right now, when you purchase Hefty Ultra Strong bags, use Ibotta and get a $1.00 rebate! Don’t have an Ibotta account? Sign up and use code yynqdwj to score an extra $10 when you redeem your first rebate! I stepped on, tripped over, and cursed far fewer toys almost immediately. My kids started to clean up their messes with less nagging after they realized that they would not be getting any other toys out until they cleaned up the ones they were playing with. Because each toy had it’s own container, they knew how to clean up the toys and where to put them. This was definitely a matter of consistency and took a couple weeks. My kids take better care of their toys because there is less to take care of. The responsibility doesn’t overwhelm them anymore. I noticed this about a month after we donated our toys and I couldn’t stop smiling. Did I just have a mom win?! You can live a simpler life with fewer toys and have happy kids. It’s possible. Good luck on your toy purge and don’t forget to get $1.00 off with Ibotta when you purchase Hefty Ultra Strong Kitchen Trash Bags. Thanks, Gayle! It’s hard to control the toys! 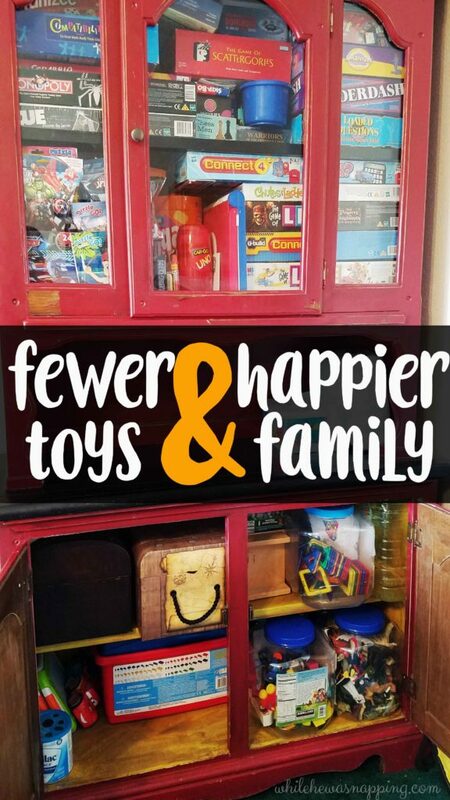 And I’m sure we’ll have far too many toys again after the holiday season, but now that we know that fewer toys doesn’t mean unhappy kids, hopefully, it will be easier to keep them to a number we can handle. We don’t always have clean floors around here, but less toys does make clean up time go much faster and my boys don’t get overwhelmed with it anymore. (Well, not as often as they used to anyway!) Good luck and I hope your daughter can find a system that works for them!